Home › Top Story Of the Year › 2012 › Obama admits his support for Al Qaeda, do you? You better not. If you don’t want to get killed by a drone or indefinitely detained forever in some black site dark hole pit somewhere. Who knows you’ll probably get tortured into admitting who knows what. Why would all of this happen to you? Well, if you support Al Qaeda this is exactly what will happen to you. As a matter of fact it could happen to you if a government agent ACCUSES you of supporting Al Qaeda. However, if you are Barrack Hussain Obama it doesn’t work that way does it? The story of the millennium, the decade, and the year has to be the SHOCKING FOX news story by Ben Swann. In this amazing report Barack actually admits to providing MILLIONS OF US TAXPAYER MONEY as aid to Al Qaeda “rebels” in Syria and Lybia. This interview should have sent shock waves throughout the entire media world but instead this shocking report is barely a story at all and hasn’t received very much coverage. The talking heads are scared to talk about this, I guess it doesn’t fit into their pre-paid narrative. The goal is to document what is REALLY happening in our world and why in hopes that we may look at what we are doing as a NATION and correct our actions for the betterment of ALL people. So now that we know Obama supports Al Qaeda terrorists in two countries what can be done about it? 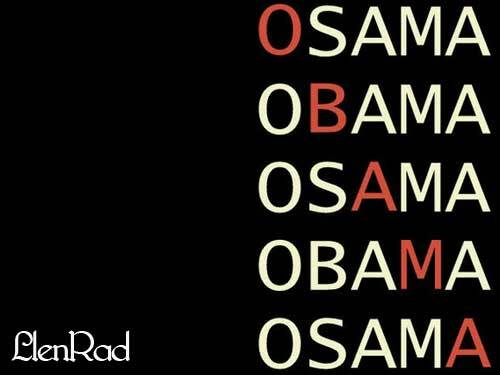 Well, the first thing I think everyone should do is unappologize for calling Obama Osama all those times. It turns out maybe your subconscious mind was trying to tell you something. Osama Bin Laden is not here to defend himself but Barack Hussein Obama must be proud of his work as he has openly admitted to supporting Osama’s Al Qaeda not just personally but with YOUR TAX MONEY. Does this make Obama OSAMA 2.0? Maybe Americans should sue like Chris Hedges did to prevent the government from indefinitely detaining him. If you haven’t heard Obama did sign into law the NDAA which allows the government to kidnap whoever it wants and even kill you if they CLAIM you support Al Qaeda. NO proof NO trial just boom you’re GONE just because someone in the GOVERNMENT says you are connected to AL QAEDA. Americans travelers are already dealing with Janet “The Super Freak” Napolitano who forces millions of people to be temporarily detained and searched and scanned on the regular to prove they are not “Al Qaeda” terrorists. Then last week it was announced that Chris Hedges won his law suit. Is this the new path to American freedom? RUSSIA: Syrian rebels using US made heat seeking missiles. Back in the 1940′s & 50′s, “if you supported Communism, you COULD be disappeared. So, it makes me wonder about my neighbors. They voted for Obama the last time, & are going to this time. They both have ‘Obama/Biden’ stickers on their bumpers, & also have Obama/Biden signs in their front yard. Does this, “make them sympathizers of supporters for al kayda”? YIKES!